Ebac - Neptune : Dehumidifier Review • The Air Geeks, reviews of air conditioners, dehumidifiers and air purifiers. The Neptune is a compact humidity control system that offers an impressive dehumidification capacity of 51 pints per day. This portable dehumidifier is suitable for a wide array of residential, commercial, and industrial applications. It is a suitable option for offices, workshops, basements, stores, and server rooms to mention a few. This features-rich unit is designed to deliver optimum performance while consuming minimum energy. Considering that you could be planning to purchase this unit for your dehumidification needs, we have gathered all the information that you need to make an informed decision. We have researched widely to provide you with unbiased information about its performance, features, strengths, and even weaknesses. In addition, our in-depth research about this dehumidifier hopes to answer virtually all the questions that you have regarding this appliance. By the time you are through, you will be able to make a wise decision on whether this is the best unit for your dehumidification needs. Without wasting time, we will start by exploring its features and performance. Let’s go! 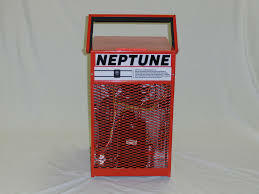 Neptune, Greek God of the sea… The Neptune is a powerful dehumidifier that is designed to draw large amounts of water from the air in your room, office, basements, and so on. This compact unit is capable of pulling up to 51 pints of moisture per day. Its ruggedness and power makes it a suitable option for industrial, commercial, and residential uses. In case you are looking for a powerful system that you can move from one place to another, then you need a portable unit. 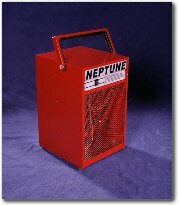 The Neptune is a portable unit that features a collapsible handle. This handle allows users to move the unit from one position to another with ease. In addition, the portability of this unit enables you to use it in more than one place. In residential environments, excess moisture can damage valuables and cause other items to rot. It can also encourage the growth of mold and mildew. In industrial environments, excess moisture is known to cause corrosion and rusting. The Neptune is designed to ensure that the relative humidity is maintained within the desired levels. It ruggedness enables it to withstand harsh environments and extreme conditions. Furthermore, this unit features a high-efficiency rotary compressor that is optimized to consume minimum energy. In case you are looking for a system that will help you to save money, then this unit is a suitable option. Are you looking for a dehumidifier that offers a defrost control mechanism? The Neptune offers a temperature-sensitive defrost control that utilizes hot gas to prevent build-up of frost. This defrosting feature works by melting accumulating frost to prevent its build-up. Furthermore, this unit is strongly built and cannot break easily. Its epoxy powder-coated steel chassis enhances its durability and ruggedness. The anti-vibration rubber feet of the Neptune ensure that minimum vibrational noise is produced. Furthermore, it comes with a 25 ft power cable. The design of this dehumidifier allows simplicity of installation and ease of use. Are you looking for a unit that offers a humidistat? Unfortunately, this unit does not offer a humidistat. In case you badly need this feature, then you need to think about another dehumidifier. We have also noted that this unit does not run quietly. It produces a relatively loud sound that can disturb noise-sensitive people. But of course, such a strong dehumidifier is used for applications larger than a single room. Highly durable. This unit is strongly built to withstand extreme conditions and harsh environments. Its design makes it a suitable option for people who want to invest in a durable unit. Features a long power cable. In most cases, no extensions are required because the cable is extra-long. Unit lacks a humidistat. This unit does not feature a humidistat. Instead, it offers an on/off switch. Produces a loud sound. If you intend to use this unit in a quiet place such as your office or bedroom, then it may not be a suitable option if you are highly sensitive to noise. However, it does not produce an irritating sound. Finally a well made dehumidifier! This is so well made, from metal! After replacing the cheap and flimsy plastic ones from the home improvement centers on average every two years, this is well worth the extra money for a well constructed unit... and it is not made in China, the main reason I purchased this unit. The cord is plenty long enough to reach the outlet on the wall to the center of the basement, no extension cord needed. There is no humidistat, just an on/off switch, which I consider a good thing. They don't work right anyhow. Every other dehumidifier I've had they never worked right and I used an appliance timer on them. So I just use the same appliance timer on this one. It keeps my basement drier than the previous unit it replaces and used less electric doing it. The biggest plus on this unit I think is that there is no water bucket to empty. The included hose and clamp lets it drian directly into the floor drain. No more nasty, scummy water bucket to clean out!" Great unit; exceeds my expectations." The Neptune is undeniably a strong unit that is designed to run for years without breaking. This rugged unit is a suitable solution for those who are looking for a unit that blends durability with energy efficiency. Although this unit offers some impressive features, we have noted that it lacks a basic feature: a humidistat. We have also noted that it is not whisper-quiet and it may be a source of disturbance for noise-sensitive people. Are you planning to use this system in a place where its noise level will not affect you? If your answer is yes, then you can proceed and buy this rugged and durable dehumidifier. A very good pick according to us at the Air Geeks.